Mike Ferguson’s media and communications career is two decades in the making. He lives in Richmond Heights, Missouri and holds a Bachelor of Science from Charter Oak State College, having majored in Communications. He is also the former Program Director and afternoon show personality at KLJC in Kansas City (now known as “Life 88.5”) and has been the news director of a non-profit statewide news service based in the Missouri State Capitol. Prior to his work in mid-Missouri, Mike was the news anchor for KLJC-FM. He got his on-air start in radio as a news/traffic/sports anchor for Metro Networks-Kansas City and later hosted “The Independent Perspective”, a weekend talk show, on KCWJ in Kansas City while also producing and anchoring the news during the week. He’s also been a newspaper reporter and a television assignment editor for a major network news affiliate. · Named to the Missouri State Plan Committee by then-Secretary of State Matt Blunt in 2003, where he worked with representatives of political parties, special interest groups and various governmental organizations to develop Missouri’s plan for improving our election process. The Missouri State Plan Committee was created in response to the Help America Vote Act of 2002. 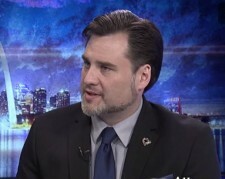 · Mike has appeared as a guest on the then-nationally syndicated “On Main Street” in 2002 to discuss financial issues and has been a guest on FOX News’ “Freedom Watch” with Judge Andrew Napolitano multiple times to update a national audience on Missouri controversies. · Appointed to the City of Grandview’s Transportation Committee by the Mayor and Board of Aldermen in April of 2005, where he represented the city’s Ward III until being elected to the Board of Aldermen. He was elected Chair of the committee in 2006, 2007, 2008 and again in 2009. · In April 2007, Mike was elected to the non-partisan Board of Directors of Jackson County Public Water District No. 1, where he represented a portion of the City of Grandview. He won the two-way race with over 72% of the vote. · Named to the Grandview Planning Commission by the Mayor and Board of Aldermen in January of 2008. · Mike was elected to the Grandview Board of Aldermen in April of 2009, serving until he moved to Columbia to join the Zimmer Radio Group. Mike is an avid baseball fan. His personal interests include reading, fitness and Judo. Mike’s favorite topics to read about are history (particularly biographies and autobiographies), economics and current events.